All transactions are safe and secure with a reliable history in online purchasing behind each of our associates. Buy the Gypsy! Give Me Your Tears! t-shirt to own Borat clothing and merchandise. As Borat and Azamat cruise along in their ice cream truck, they encounter a gypsy village. Borat confronts the gypsy, who claims that she is a Midwestern farmer's daughter. He demands her tears in order to remove a curse. 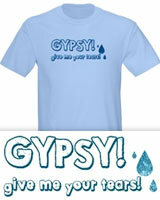 The fronts of these Borat t-shirts display the movie quote, "Gypsy! Give me your tears!" Among the Gypsy's treasures is a Baywatch magazine, where Borat first sees a photograph of Pamela Anderson. In addition to the Gypsy! Give Me Your Tears! tee above, browse the Borat Clothing Gallery for more apparel like men's and women's clothes, kids shirts or hoodies.